I’m trying something different with this blog post. It would seem that my original idea to write a snappy bite sized slice of history seems to have grown to be more of a rather bloated stodgy cake of history! 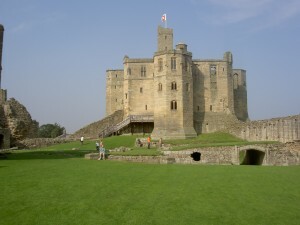 I’m going to attempt a short Q & A of interesting facts about the Plantagenet’s. This is inspired by Derek Wilson’s brilliant A to Z of The Plantagenets in the November 2011 issue of BBC History Magazine. The Plantagenet dynasty ruled England longer than any other royal family. Geoffrey of Anjou claimed the crowns of England and Normandy in right of his wife Matilda when Henry I died in 1135. 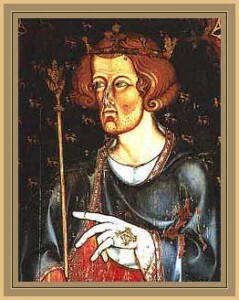 Their son Henry was recognised as hair-apparent in 1154. The Plantagenets ruled until 1485 when Richard III, the last Plantagenet was defeated at the Battle of Bosworth Field by Henry Tudor who became Henry VII; the first Tudor Monarch. In the twelfth century Geoffrey of Anjou wore a sprig of the common broom, known in Latin as the Planta genista in his hat. Plantagenet is a corruption of Geoffrey’s nickname Plantegenest or Plante Genest. Interestingly there is hardly any evidence of the name being used before the mid fifteenth century but has been applied retrospectively as a surname for all descendants of Geoffrey of Anjou. It’s suspected that the name was popularised by Shakespeare. Edward longshanks was the nickname of Edward I who reigned from 1272 to 1307. Longshanks is a reference to Edwards tall stature and literally means “long legs” or “long shins”. On 2 May 1774, the Society of Antiquaries opened Edward’s tomb in Westminster Abbey. They reported that his body had been well preserved over the preceding 467 years, and measured the king’s body to be 6 feet 2 inches (188 cm). At this length, he would tower over most of his common contemporaries who would average around 5 feet 5 inches (170cm) in height.